The sun never sets for half the year. Oh what a place for Six-One-One. Good luck to you deadbeats, we’re flying off tonight. Events of Dunkirk relegated another ongoing military campaign to the rank of second-rate news. 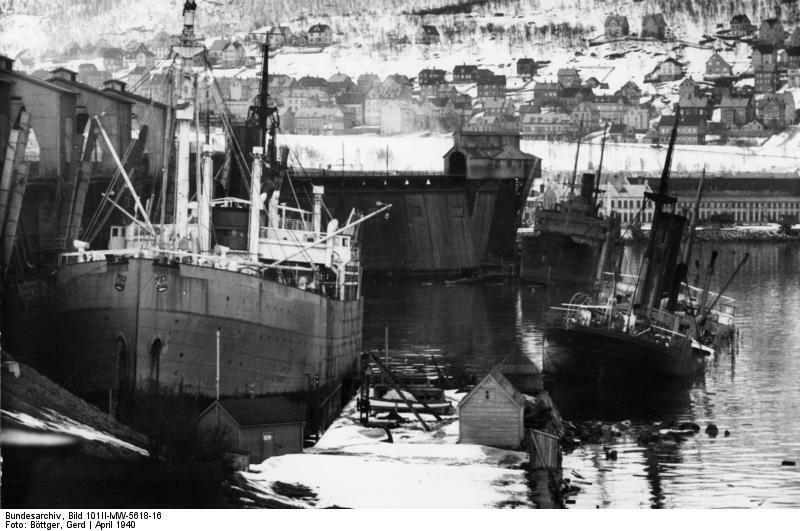 In Norway, which had been invaded by the Germans on 9 April, the Allies had recently succeeded in recapturing Narvik in the northern part of the country. Unfortunately, the German Blitzkrieg in France and the Low Countries had immensely altered the overall situation and so on 24 May, a decision was made for general retreat from Scandinavia. Code-named operation Alphabet, the withdrawal took three days, starting with 5 June. Two troop convoys were formed, the first sailing on the 7th and the second departing on the 8th, after demolishing rail lines and port facilities ashore. Sadly, the day of departure from Norway brought another disaster to the British. In the afternoon the aircraft carrier HMS Glorious and her escorting destroyers HMS Acasta and HMS Ardent were intercepted by the German battlecruisers Scharnhorst and Gneisenau. The three British ships were sunk by gunfire in a little over two hours. It was the worst blow suffered by the Royal Navy since start of the war. The loss of life was terrible: more than 1500 officers and men. Onboard the carrier were Hurricanes of No. 46 Squadron RAF, succesfully evacuated from Norway through a brave feat of their pilots. My older brother Sgt Pilot Stanley Andrew participated in No. 46 Squadron’s deployment to Norway with HMS Glorious. He was in the first section and must have been one of the youngest pilots, just 21 a month before the described devents. This is his story. No. 46 Squadron, equipped with Hawker Hurricanes, had its home base at Digby where it had remained since the start of the war. In May 1940, they were selected to form part of the Expeditionary Force in Norway. Modern fighters were urgently needed to augment the handful of Gladiators operating in that area. Because of the urgency of the situation it was decided that the air component would be embarked onboard an aircraft carrier and launched off the Norwegian coast. This was the first time when modern land-based fighters were to take off from a Royal Navy carrier. On 14 May, the Hurricanes of No. 46 left the Clyde onboard HMS Glorious for an airfield near Harstad, but had to return with the carrier to Scapa Flow when the landing ground was found to be unusable. The second attempt took place on May 26th. The Hurricanes were to be launched the flight deck of HMS Glorious 40 miles off the Norwegian Coast and 100 miles North of Skaanland. On receipt of a signal saying that Skaanland was ready to receive the squadron, the first six Hurricanes were ranged on deck. Owing to the flying-off deck having a ramp at the forward end, there was some doubt whether the aircraft would be airborne by the time they reached the top, as, according to the figures produced by the Air Ministry, 272 ft. were required for take off, provided a 30 knot wind was obtained. Unfortunately a flat calm prevailed at the time but thanks to the Captain and the Commander Engineer, almost 30 knots was obtained over the deck. The first take off was carried out by the Squadron Commander and proved quite successful, the Hurricane taking off easily just before the top of the ramp. All 18 aircraft were flown off successfully. The first flight landed at Skaanland at 21.30 hrs, still clearly visible due to the midnight sun which permitted round-the-clock flying at this time of the year. On attempt to land, one accident occurred owing to the soft surface of the aerodrome. On the arrival of the second flight another Hurricane was damaged for the same reason and the decision was then made to send the remaining aircraft to Bardufoss, 60 miles North. Orders were given to this effect to aircraft by R/T from aircraft on the ground. These aircraft arrived safely at Bardufoss. Operations commenced on the following day. At 07.20, a patrol consisting of S/L Cross, F/O Frost and P/O Bunker took off at to intercept 3 Heinkels He 111 approaching the aerodrome. The enemy formation was sighted but as they were going away from the landing ground they were not engaged, orders having been received that aircraft were not to be attacked unless Skaanland itself was attacked. One aircraft – again – crashed on landing from this patrol and permission was asked for No. 46 Squadron to evacuate the airfield until such time as the aerodrome surface should prove suitable. This permission was received and by 18.00 hrs. all fifteen serviceable aircraft had arrived at Bardufoss. From Bardufoss, the first combat patrols over Narvik were st up the same evening by a section of three aircraft led by the Squadron Commander. Patrols were maintained until 04.15 of 28 May when fog covered the aerodrome and the eighth returning patrol was fortunate in having half the runway clear to land. At 18,000 ft, pilots had a clear fine view of the attack by Naval vessels and land forces. At one time as many as seven large fires were seen in Narvik town and ten at Ankenes on the side of Veissfjord. A column of smoke reached a height of 7,000 ft. In the morning, patrols were resumed by the same pilots, who had no sleep for two nights. This time the Luftwaffe showed up in numbers. At approximately 11.00 hours F/O Lydall shot down a Ju.88 over Obotfjord. Later, F/L Jameson, F/O Knight and P/O Johnson destroyed two four-engined flying boats on the surface of Rombaksfjord. Patrols and combats continued until the morning hours of the 29th. At 00.40 hrs, F/L Jameson shot down a Ju.88. P/O Drummond went missing during this patrol. Later a message arrived from HMS Firedrake saying that P/O Drummond had descended by parachute and had been picked up by them. Firedrake confirmed the destruction of a Ju.88 by F/L Jameson and also that Drummond had shot down a He 111 which crashed in the nearby fjord. Drummond’s aircraft had been set ablaze by the defensive fire from the German bomber. No respite was given throughout the afternoon, when P/O Banks shot down a four-engined (sic) Junkers which was bombing Tromso. In the evening, 26 enemy aircraft approached Vestfjord from the South and split up into formations of five aircraft. Nine Hurricanes were on patrol at the time and in subsequent encounters with superior forces F/O Lydall and P/O Banks were shot down and killed. F/Sgt Shackley shot down one Junkers Ju 88 and two more enemy aircraft were destroyed, probably by a joint effort of F/O Lydall and P/O Banks. On 30 May, weather closed down, bringing a much-needed opportunity for the pilots to rest. The next day, Bodo was evacuated by British Forces, No. 46 maintaining patrols over the area. The rear party of the squadron, which had left Britain onboard a merchant ship on 28 May, finally arrived at Harstad. Unfortunately, orders for total evacuation were already given and they were sent back by sea to Scapa Flow.